*Monday, March 27, 12:30 pm at the Frank Fischer Senior Center. *Monday, March 27, 6:30 pm at the library. *Wednesday, March 29, 1:30 pm at the library. 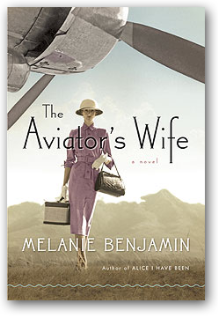 The Aviator's Wife, a work of historical fiction, tells the story of Anne Morrow, a shy woman who is wed to the famous pilot Charles Lindbergh in a headline making wedding. Despite her many achievements following the wedding, including becoming the United State's first female glide pilot, Anne continues to live in the shadow of Charles. The fairy tale life she longed for would end up bringing heartbreak and many challenges to Anne's life which caused her to challenge her need for love and independence and to embrace the possibility of life's changes. Join us for a lively discussion of the book and treats. If you cannot make it in person, visit our book club blog at kplbookclub.blogspot.com. Each month the KPL staff will post discussion topics and questions to get you "talking." Join the discussion by adding a post to the blog.